WALKSacramento and walkable communities enjoyed some key successes in 2012. At the regional level, the Sacramento Area Council of Governments adopted the region’s first Sustainable Communities Strategy, which included a significant increase in funding for active transportation around a vision of transit-oriented development. WALKSacramento helped lead the fight for a more sustainable future in regional planning through attending public meetings and organizing informed comments on the proposed plans and scenarios. Follow up work in 2013 includes developing a system to track progress on SCS goals. 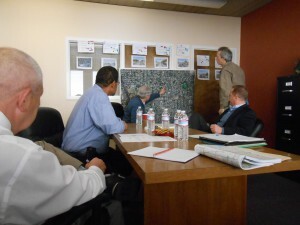 WALKSacramento staff, Terry Preston and Chris Holm (left/center), work with Sacramento County Dept of Transportation staff, Bill Irving and Ron Vicari (right) to consider improvements to Fruitridge Road. Robert Guildner (far left) of the Fruitridge Manor Neighborhood Assn also attends. Locally, WALKSacramento conducted several walk audits and pedestrian safety reviews along Fruitridge Road to assess conditions for students, seniors and pedestrians of all shapes and sizes. This work included pedestrian counts as well as bicycle counts with our partner Sacramento Area Bicycle Advocates, and careful examination of infrastructure concerns at crossings and along the street. 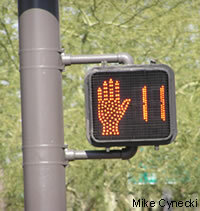 This work led to pedestrian countdown signals and crosswalk improvements at the intersection of Fruitridge and Stockton. Follow up meetings with City transportation staff and Councilmember Kevin McCarty led to a new City review of the intersection and the Fruitridge corridor. Follow up work and plans for further improvements are anticipated in 2013. A subsequent review, in November 2012, considered senior pedestrian travel to and from the Fruitridge Community Center east of Martin Luther King Jr. Blvd. WALKSacramento joined the Healthy Eating and Active Living (HEAL) initiative in the Valley Hi community of South Sacramento to conduct walk audits of Mack Road and Center Parkway and Valley Hi Community Park to review conditions for safe walking. The park review led to several successful new activities, such as a youth basketball league, to provide a busy, safe environment for families using the park. Park improvements built around the 2012 walk audit and additional community input are scheduled for April 2013. The park walk also promoted a current review by the City of potential new safer crossings across fast and busy Center Parkway to the park. WALKSacramento continued to review development project applications within the City of Sacramento and the unincorporated areas of Sacramento County, even though development activity in 2012 continued at a slow pace. Our comment letters and discussions with developers and City and County planners resulted in many projects incorporating more or enhanced pedestrian features, such as walkways, plazas, trees, signage, and access. 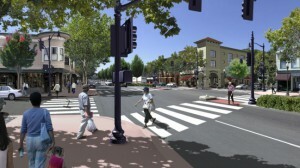 WALKSacramento also participated in transportation planning in the City and County, such as the Freeport Boulevard Bike Lanes Stakeholders Committee, the American River Crossing Alternatives Study Stakeholders Advisory Committee, the Capital Southeast Connector Sustainability Committee, and Plan Folsom Boulevard. 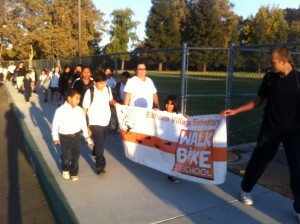 WALKSacramento wrapped up the Sacramento County Safe Routes to School Five E’s project in the beginning of 2012. Soon thereafter, Mark Polhemus was hired as a project assistant to begin work on the West Sacramento SRTS project in May. Mark has helped things in West Sacramento get off to a good start with two walk audits, pedestrian and bicycle education lessons for 1500 students, and two city-wide walk to school days already completed. SRTS work continued in Citrus Heights where we finished the final round of walk audits. In Natomas, WALKSacramento helped provide critical input into the conclusion of three SRTS road projects near three Natomas schools. 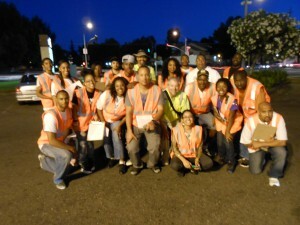 WALKSacramento organized the walk audits that led to funding the projects and committed to seeing them through. 2013 will be a big year for WALKSacramento in Safe Routes to School as we hit our stride in West Sacramento, complete the Citrus Heights SRTS Master Plan, revisit walk/bike encouragement programs in Natomas USD, and start work on an SRTS grant from the California Department of Public Health that will grow SRTS programs throughout the region. It will also be a time for the Sacramento region to show off its Safe Routes credentials when a national audience arrives for the national Safe Routes to School national conference in August. What successes will 2013 bring? Stay tuned here to find out!